The large amounts of anthocyanins found in Aronia is a powerful anti-aging antioxidant and may also have cancer fighting properties. In addition, Aronia is known to support vision enhancement, aid the treatment of heart and vascular diseases, as well as diseases involving stroke and problems with blood circulation. Acai berry is a fruit from a palm tree that grows in northern Brazil near the Amazon rainforest. Antioxidants found in Acai berry supports the prevention of cancer and diabetes, and anthocyanin found in Acai berry promotes healthy skin and kidneys. In Brazil, it called the "fruit of life". Black currant is rich in anthocyanin and polyphenols making it very nutritious. It looks very similar to blueberries, but it is darker in color and has more antioxidants. 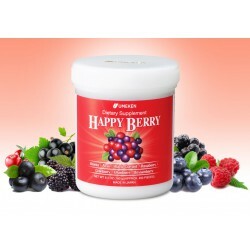 It is also more abundant in nutrients such as vitamins, anthocyanin, polyphenols and magnesium compared to other kinds of berries, resulting in a greater antioxidant effect. Some have nicknamed it, the “King of Berries”. Raspberries are often used to supplement cancer treatment drugs as they are rich in vitamins, minerals, and phytosterols. Raspberries are also rich in omega-3, and contain a lot of soluble dietary fiber to help lower cholesterol. Cranberries help prevent bacteria from attaching to cells, and have shown to be effective against periodontal disease and gastric ulcers. Anthocyanin pigments found in cranberries have demonstrated an ability to aid vision enhancement, improve liver functions, and protect against night vision loss. Blueberries contain anthocyanin and large amounts of dietary fiber to help with vision health and promote anti-aging. It is beneficial for everyone, including adults and growing children, as it is abundant in antioxidants, helps prevent diseases, aging, urinary tract infection, improves liver function, aids dieting, and supports healthy skin. Boysenberries contain the nutritional benefits found in both raspberries and blackberries. It contains fiber, essential antioxidants such as anthocyanin and ellagic acid, folate, and phenolic compounds to protect the body from free radical damage. 180g(400 balls) 2 month supply. / Take 6 balls daily.